EverGreen® Autumn 2 in 1 Spreader 100sqm (3.5kg) easy-to-use hand held container lawncare fertiliser strengthens grass roots and kills moss in lawns, providing winter lawn protection in 7 days. Benefits from seaweed extracts and is suitable for application from September to November. Suitable for lawn use only and recommended for use in Autumn which is the ideal time to strengthen grass roots. NPK 6-5-10 (Nitrogen, Phosphorous and Potassium) . 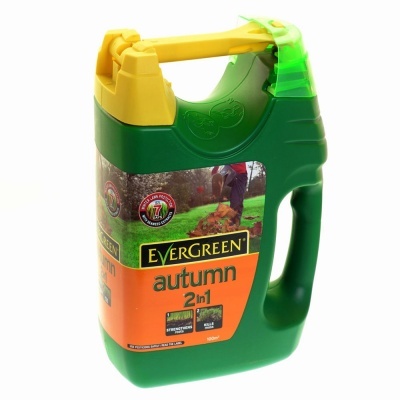 EverGreen® Autumn 2 in 1 refill packs available separately.